Do you know what that sound is, Highness? Those are the Shrieking Eels — if you don’t believe me, just wait. They always grow louder when they’re about to feed on human flesh. If you swim back now, I promise, no harm will come to you. I doubt you will get such an offer from the Eels. In this blog post, we’ll explore if the migration of one eel is influenced by the tide. It’s a research use case for our R package wateRinfo, which was recently peer reviewed (thanks to reviewer Laura DeCicco and editor Karthik Ram for their constructive feedback!) and accepted as a community-contributed package to rOpenSci. 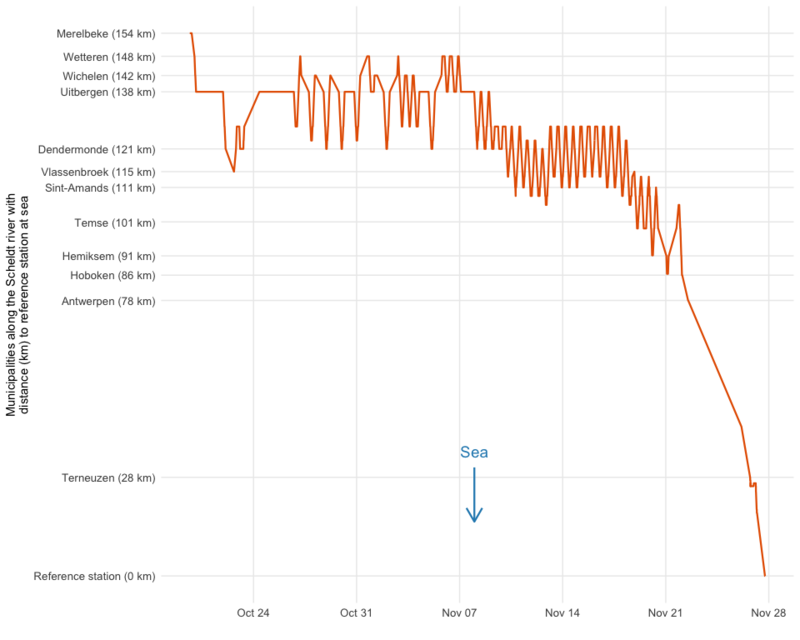 Pieterjan provided us the tracking data for eel with transmitter A69-1601-52622. Let’s call her Princess Buttercup, after the princess that almost got eaten by the Shrieking Eels in the classic and immensly quotable movie The Princess Bride. 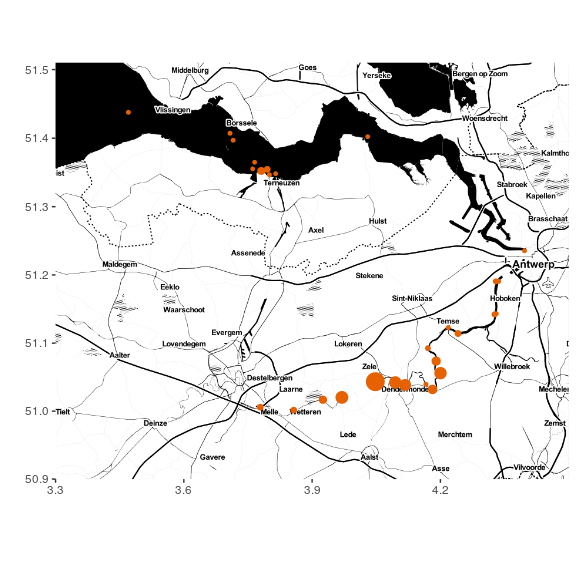 Her tracking data consists of the residence time interval (arrival until departure) at each receiver station that detected her along the Scheldt river. It also contains the calculated residencetime (in seconds), as well as the station name, latitude and longitude. Princess Buttercup’s signal was picked up by receivers in Merelbeke (near Ghent) shortly after she was captured and released there on October 11. She resided in a 40 km stretch of the river (between Wetteren and Sint-Amands) for about a month before migrating towards the sea and starting the long journey towards the Sargasso Sea. The periodic movement pattern up and down the river during the second half of November is of particular interest: it looks like tidal frequency 2. 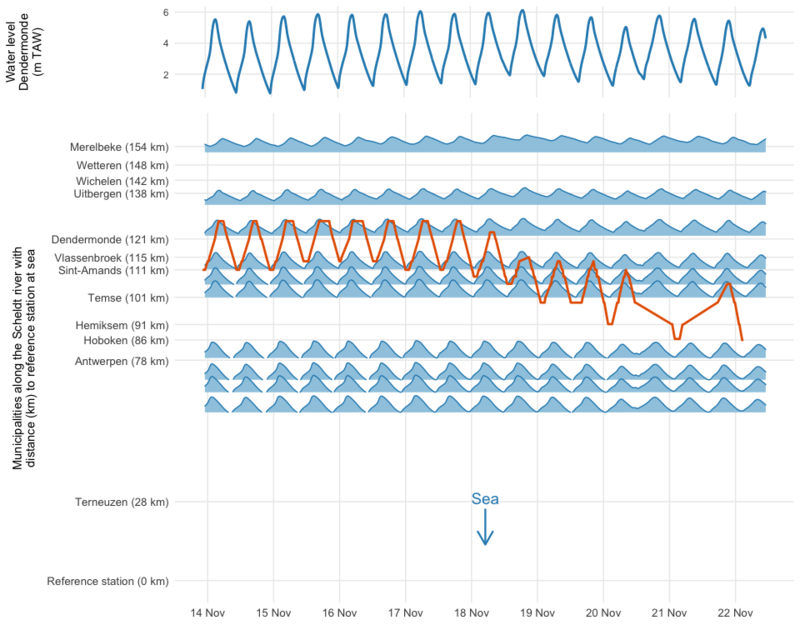 It would be interesting to compare the movement pattern with real water level data from the Scheldt river… which is where our wateRinfo package comes in. Waterinfo.be, managed by the Flanders Environment Agency (VMM) and Flanders Hydraulics Research, is a website where one can find real-time water and weather related environmental variables for Flanders (Belgium), such as rainfall, air pressure, discharge, and water level. The website also provides an API to download time series of these measurements as open data, but compositing the download URL with the proper system codes can be challenging. To facilitate users in searching for stations and variables, subsequently downloading data of interest and incorporating waterinfo.be data access in repeatable workflows, we developed the R package wateRinfo to do just that. See the package documentation for more information on how to install and get started with the package. We now have all the pieces to verify if Princess Buttercup was surfing the tide back and forth. Is Princess Buttercup surfing the tide? Looking at the plot, Princess Buttercup seems to be “lazy” and drift with the tide. Rising water levels push her upstream, while decreasing water levels bring her closer to sea again. On November 22 (see also previous plot), she embarks on her migration for real. In this blogpost we used the wateRinfo package to gain some insight in the movement/migration behaviour of an individual eel. We hope the package can support many more research questions and that you have fun storming the castle. For a more in depth study of eel migration behaviour in response to the tide, see Verhelst et al. (2018). For more info on the package, see the package website. For the full code of this blogpost, see this repository. Waterinfo.be data is made available by the Flanders Environment Agency, Flanders Hydraulics Research, Agentschap Maritieme Dienstverlening & Kust and De Vlaamse Waterweg. The fish acoustic receiver network, as well as the work by Stijn and Peter, is funded by FWO as part of the Flemish contribution to LifeWatch. 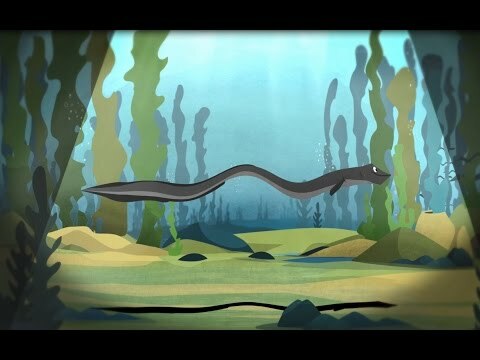 The animated video on eel research was funded by the Flanders Marine Institute (VLIZ), coordinated by Karen Rappé and Pieterjan Verhelst, animated by Steve Bridger, and narrated by Bryan Kopta. If you want to get in touch with our team, contact us via Twitter or email.